Vertical Panel Saw purchase; 13 things to look for before pulling the trigger. 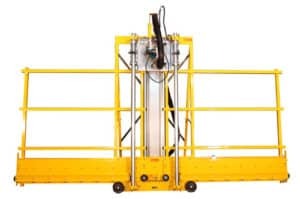 | Saw Trax Manufacturing, Inc.
Vertical Panel Saw purchase; 13 things to look for before pulling the trigger. Since all panel saws “look the same”, how do you know which one to purchase? As the old saying goes, the Devil is in the Details. So we decided to help people understand what makes one better than the other. 2. What is the Bearing mechanism that the carriage uses to travel on the guide tubes? Brand A uses 12 Sealed Steel Bearings while Brand B uses a U bolt with black rings on it and a button glide on the carriage. The bearing makes the carriage move smoothly with no play. With the friction U-bolt ring arrangement, when you take the play out, the carriage becomes harder to move. 3. Material support is an important issue when cutting full size sheets. On the full size machine, Brand A uses 18 material rollers and a center step for support. Brand B uses 14 rollers where 12 of the center rollers need to be kept in alignment because they can move up and down and no center support. 4. Guide Tube alignment with the material rollers is critical for square cuts. All panel saw companies set this at the factory. Brand A but has a patented alignment system that keeps it from going out of square in the future. Brand B has a 3 page alignment process that has you building an alignment tool to begin it and whacking the guide tubes with a dead blow mallet. 5 . Component based system is being able to replace key components should they get damaged. If you look at a Home Depot store, you will see big Bollards near the panel saw. These are here because if the material fence or guide tube is damaged, they will need to replace the entire saw since these components are welded. Brand A has these two key components bolted onto the frame so they can be replaced easily if they become damaged. Brand B has these components welded on so they can’t be replaced and a new machine needs to be ordered. 6. Flexibility of cutting can also be an issue. Brand A uses a quick release carriage that allows for different saw inserts to be used saving time changing blades or different cutting tools to be used like a router, pivoting knife (foam material), glass cutter or a rolling shear for 3 mm ACM. Brand B does not offer this capability in their standard machines. 7. Factory attached components saves you time in set up. Brand A attaches their components like their folding stand, frame wheels and their mid-fence. Brand B has you try to bolt these components on and then align them. 8. Flexibility of feed. For some operations, it is faster to be able to have your measuring system on both sides of the cut when cutting pieces from a full sheet. Brand A offers tapes on both sides while Brand B doesn’t. 9. Will you get a damaged panel saw upon delivery? Nothing is worse than getting your machine and have it damaged so you can’t use it for the big job you purchased it for. Brand A fully crates their machine, even adding a strap so it can be strapped to the sidewall of a truck. Brand B shrink wraps their machine and hopes for the best. 10. Dust collection is more than just a convenience today. With the many different material like cement board and the chemicals in some substrates, particulate in the air becomes an important concern. Brand A has a dust brush surrounding the saw blade under the insert with a 2.5″ hose attached to the dust bonnet for extraction of the suspended particulate. Brand B uses a vinyl tube that has to be constantly adjusted up or down to rest on the different thicknesses of material cut. If you forget to adjust it one time, the material pushes the tube into the saw blade and you no longer have dust collection. 11. Spinning insert and a locking carriage to rip cut is important for fast use. Brand A has two indexing pins and two carriage locks to ensure precision use. Brand B does not. 12. Powder coated components. Powder coating is a baked on enamel that ensures long-term metal protection. Brand A powder-coats their metal parts. Brand B does not. 13. Welded components; When you weld metal, the heating often distorts the material and can have unseen faults that will affect the structural integrity of the metal. That is why buildings and bridges are riveted. Brand B welds these parts because it is cheaper and easier to manufacture that way. Brand A does not because they make a component design so you can replace parts like a fence or a guide tube. (These are the two most replaced parts. At a home center store you will see big bollards in front of the panel saw because they have to replace it for every bump it gets.) With Brand A, component design you can replace a guide tube in 2 minutes and a fence in 4. With Brand B, you are replacing the entire panel saw not just the part. Besides the ease of replacement, you don’t damage or deform the parts by welding them. On their fence of Brand B, each material roller needs to aligned individually to make sure you are getting a square cut because the fence plate is welded to the frame. Brand B has 13 adjusting points to square their panel saw. That is why the home center stores will not guarantee an accurate cut. By the way, Brand A is from Saw Trax Mfg. Inc.